Overo horses are white patterned horses. Much confusion still exists in the classification of overo and the other pintos, especially in the US. However overo is genetically distinct from other white patterns such as tobiano, splashed white and sabino. 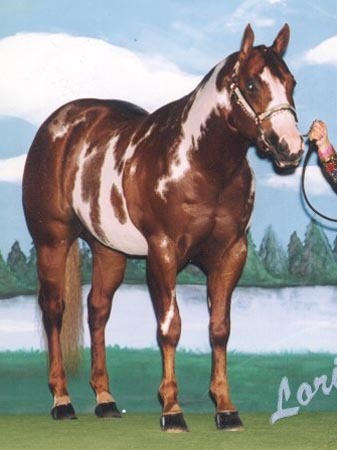 Sometimes splashed whites and even sabinos are referred to as overo, but these patterns are caused by separate genes. In fact overo can occur in conjunction with these patterns, and also in combination with tobiano (so called tovero). Overos are often referred to using the descriptive term of “frames” or frame overos. Frame overos have white patches on their sides with a "frame" of color surrounding the white. However overos can range in the extent of white from minimal to extensive. Minimal overos tend to have white on the face, a white spot on the side or sides of the neck and possibly a small patch or patches over the ribs. Very minimal overos may look like solid horses with normal white markings. Overo "crop-outs" from supposedly solid Quarter Horses indicate that many registered as Quarter Horses are actually minimally-marked overo horses. The majority of classic frame overos have solid color over the backbone from the withers to the tail bone with white on the sides. Some frames have white patches that spread from the belly right up to the back. White patches may have colored spots within. Most frames have solid colored tails and manes, although there may sometimes be white in the mane where a white patch crosses over the neck. There are often large irregular white markings on the face, sometimes over the whole face (such as apron face, bonnet face or bald face), sometimes on one but not the other side of the face. Where white occurs around eyes these may be wall or blue. Overo horses are the only pintos that can have all four legs colored, with most of them having at least one totally solid colored leg. Overos with extensive white still tend to have a “frame”. The borders are the hocks, the backbone from the withers to the tail, upper arms, chest, underside of the neck and the poll. Overo horses are most common in the American Paint horse, but also occur in a number of other American breeds, including Miniature horses, Tennessee Walking Horses, Saddlebreds, American Shetland ponies and mustangs. The pattern isn’t found in European or Australian breeds, and only occurs in these countries due to relatively recent importations. 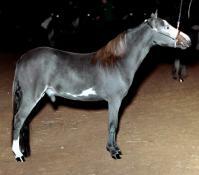 This gave an opportunity for geneticists to sort out the inheritance of overo and distinguish it from sabino and splashed white, with which it is frequently mistaken. In particular Jeanette Gower did a lot to help sort out the confusion. In the past, it was thought that the overo gene was recessive, but it has since been realised that overo is actually dominant. Furthermore all overo horses are heterozygous for the overo gene since it is lethal when homozygous. Thus the overo allele (Oo) is dominant for color pattern but has a recessive lethal effect. This allele shows pleiotropy, having more than one effect on the phenotype. 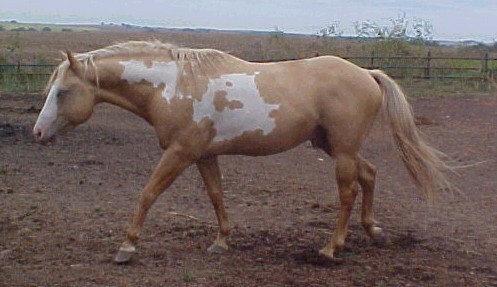 Other pinto patterns aren’t associated with lethal white overo syndrome.